Let me recap what has actually happened up until now. Pilot Rayford Steele was thinking about asking out stewardess Hattie Durham, but then the Rapture happens, and his wife and son vanish. He eventually reunites with his daughter, who returns from college. Buck Williams, the journalist, meets Hattie on Rayford's flight and subsequently introduces her to Nicolae Carpathia, a young Romanian politician whose oratory elevates him to the head of the UN. Meanwhile, Rayford has found a pastor in Bruce Barnes, and his daughter Chloe and Buck all join together as the kernel of a new church, calling themselves the "Tribulation Force." Nicolae establishes a world religion and world government based in "New Babylon," with the assistance of his secretary, Hattie Durham. In defiance of this, Rabbi Tsion Ben-Judah, a famous Jewish scholar, has concluded that only Jesus could have been the Messiah, and starts recruiting the 144,000 Jewish converts predicted in Revelation. Two unusual men have appeared at the Wailing Wall, preaching almost continuously and invulnerable to attack. World War III breaks out when some governments revolt against the UN (now "Global Community"), and America in particular is laid waste. Bruce Barnes dies, survived by loyal secretary Loretta. Rayford marries a little-discussed woman named Amanda, and Chloe and Buck marry. Buck saves Chloe from a wreck caused by the bombing. Tsion must flee persecution and his family is murdered, but he escapes with Buck's help and continues converting hundreds of thousands on the Internet. Hattie is pregnant, but disenchanted with Nicolae. She is thinking about an abortion. In the end, there is a worldwide earthquake. Loretta and Amanda die. All believers receive a magical symbol on their forehead that identifies them to each other. The witnesses have been turning water to blood and stopping all rain in Israel, and these judgments are followed by flaming hail and two comets - one of which kills a third of the ocean and the other of which turns water everywhere to poison. Buck rescues Hattie from an abortion clinic and takes her to the temporary condo headquarters of the Tribulation Force, but she has been poisoned. Rayford gets scuba equipment and checks to make sure that Amanda is dead, and dispels suspicions she might have been a plant. Thousands of believers join Tsion in Jerusalem for a prayer meeting at which Nicolae is humiliated. Tsion flees once more. Hattie loses her child, but survives herself and vows Nicolae's death. Chloe delivers a healthy child. The sun, moon, and stars all dim to 2/3 of their strength, and demon locusts attack everyone not sealed as a believer. I knew this would be a long slog, even if these books are short and simple enough to take only a few hours each. But really, it's like reading just one enormous book. Little distinguishes one volume from the next. It's just a continual outpour of banal happenings, frequent phone conversations, and wooden characters. 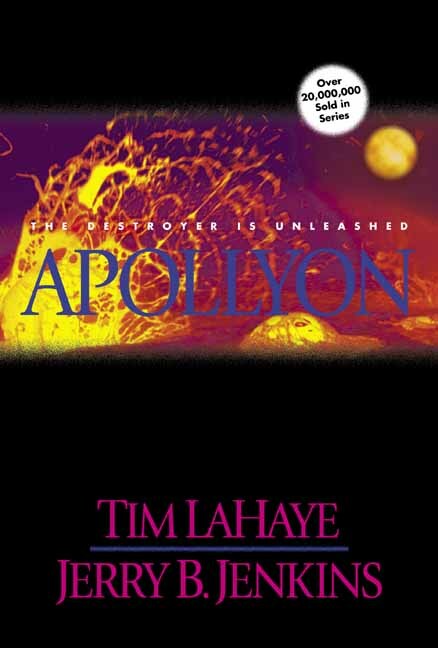 Here's an one new oddity from Apollyon, this fifth book in the series: for the first time, we get some serious attempts at description. Usually things are expressed in plain and indecorous words, rehashing old phrases. A caper is always a "wacky caper." An Australian calls everyone "mate." But for once the authors fling some seriously evocative phrasing at us. It's an odd choice of moment. You might expect a moving scene of reunion or a thunderous dismissal of evil. But instead the scene that's depicted with such unusual verve is... gross. The witnesses had not moved. Buck's eyes were locked on them as blinding white light burst from their mouths, and they appeared to expectorate a stream of phosphorous vapor directly at the guards. The attackers had no time to even recoil as they ignited. Their weapons remained supported by the bones of their arms and hands as their flesh was vaporized, and their rib cages and pelvises made ghastly silhouettes against the grass. Within seconds the white heat turned their rifles to dripping, sizzling liquid and their bones to ash. There are a couple of other moments of bizarre lucidity: when they describe the robes of a priest, when Buck is climbing down from a roof. But they're never the important moments. I can't understand it, but I suppose it's the same creative impulse that drives the authors to spend half of each book on ridiculously trivial bits and then skip past world-crushing disasters in a few sentences. For example, compare the above scene of gruesome incineration with the following description of a miscarriage, bearing in mind that they've been leading up to this miscarriage for fifty pages. Within minutes, Hattie was wracked with powerful contractions. What, Rayford wondered, might the offspring of the Antichrist look like? The dead baby was so underdeveloped and small that it slipped quickly from Hattie's body. Floyd wrapped it and pieces of the placenta, then handed the bundle to Leah. “Pathology?” she asked. This is a genuinely important - almost pivotal - moment in the life of one of the major characters, but it's tossed out like a sack of beans. The same would befall a third of the moon and the stars. Whereas the sun shone for around twelve hours every day in most parts of the world, it would now shine no more than eight, and at only two-thirds its usual brilliance. That's not a summary of the event later. That's how they describe an event of staggering importance and implications. These choices of what to highlight are recurrent and inexplicable. I've noticed that everyone knows everything in these books. That is to say, because the Antichrist has made world communications a priority ("Cellular-Solar"! ), everyone on the planet is evangelized. For a while I couldn't understand it... why was so much space being wasted describing how the new communications let everyone in the world watch the broadcasts of the "witnesses" and ubiquitous Net access let everyone communicate Scripture... was it so important it had to be belabored? But I have realized that this serves two purposes: first and most obviously, it gives a mechanism by which the Antichrist can control the world with his crazy-eyes power. Secondly, it does away with the sticky problem of the ignorant damned. See, for evangelicals like the authors, if you don't accept Jesus as your personal savior, you go to Hell. For people like me, there's no problem there: I know the choice very well, and make a conscious rejection of it. But for people who live in rural China or African tribesman from the sixteenth century, etc., there's a pretty clear problem: they have extremely imperfect or a complete lack of knowledge on the matter. Catholics get by this by citing the scripture that says "My law is written on their hearts;" i.e. if you are ignorant but act morally, you go to Heaven. But evangelical Protestants (as the authors) usually assert the traditional solas, including sola fide: through faith alone. Martin Luther originally wanted to distinguish this from the Catholic doctrine that called for good works; Luther and other Protestants felt that Jesus' sacrifice on the cross was the only work ever needed for salvation, and a Christian had only to accept that sacrifice and God's salvation for him to be saved from the fires of Hell. But... what about those who didn't hear about Christ? That's murkier. Some evangelicals feel that they go to Hell. Some agree with the Catholics. But to get away from it and to make the world perfectly just, the authors spend considerable time doing away with the problem altogether: everyone on the planet knows all about what's going on and is given really obvious evidence. So we can feel okay that the ones who don't believe are going to be damned to eternal torment: they should know better. Nifty! I want to note that I give these books a lot of leeway. I don't question unusual circumstances, improbable events, or the like. I don't ask why the protagonists happen to hear every secret conversation, be taken into the confidence of everyone important, and always manage to slip away from the eight thousand guards searching a bus for them. I recognize that the answer can always reasonably be that Jesus did it. The plot is divinely ordained, and I don't question that. Even when it's asinine (often).